In the year 1521, Juan Ponce De Leon brought a small herd of Andalusion cattle and horses with him on his second expedition to the New World. These were the first cattle and horses to ever set foot on what is now the continental United States. These horses were the product of selective breeding, and many were of Andalusian lineage. The horses played a tremendous role in Florida History.During the War Between the States, The Spanish horses were highly prized for transportation. These sturdy horses could travel in Florida's rough conditions where other horses failed. 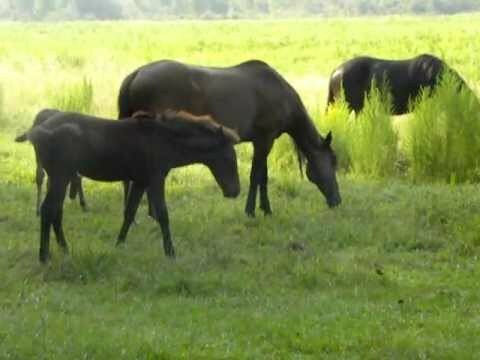 The Florida Cracker Horse is also known as the Chickasaw Pony, Seminole Pony, Prairie Pony, Florida Horse, Florida Cow Pony. The modern breed retains the size of its Spanish ancestors, standing 13.2 to 15 hands high and weighing 750 to 1,000 pounds . They are found mainly in bay, black and gray, although grullo, dun and chestnut. Is this picture taken in Paynes prairie? Beautiful, I've never seen foals out there! are those horses actually wild? I can see that you are referring to the Tarpan, which is an extinct species. If you had originally been discussing one of the reverse genetic engineering products resulting in the Heck horse, I would understand the reference. Nonetheless, I had not intended to start a debate over breeds and species. Nor had I intended to imply that the Wild Florida Spanish Horse was any less important than anything else. Peace. The scientific name of the Tarpan Equus ferus changed into the name given by Linnaeus Equus caballus by Wilson and Reeder (1993). Some scientists had criticism on this change of the scientific name of the Tarpan or wild horse. These scientists wanted that there would be made an exception for domesticated animals. Gentry et al. (1996) asked the International Commission on Zoological Nomenclature to use its plenary power to rule that the name for the wild species is not invalid by virtue of being antedated by the name based on the domestic form. The Commission has ruled in favour of the proposal and "conserved the usage of 17 specific names based on wild species, which are pre-dated by or contemporary with those based on domestic forms", confirming Equus ferus for the wild horse (International Commission on Zoological Nomenclature 2003). It has stipulated that ferus is not invalid, but has not specified explicitly what name is to be used for the species by those who consider Equus caballus and Equus ferus to be conspecific (Wilson and Reeder 2005). I believe you have mistaken my point. I do not doubt that this breed could be in trouble. It happens with dog and cat breeds often enough. But they are breeds, not species. By listing Equus Ferus, you pulled in all horses, when you knew the base horse stock. The base hose stock, being Andalusian, is a breed of Equus ferus caballus. This is distinct from the species Equus ferus przewalskii which is the one whose IUCN threat status is Critically Endangered. All that being said, I love the IFAS site as an information source. It is really one of the best. I would trust this link instead of a source link such as Wikipedia!! We are not allowed to use it as a creditable source of information. Ferus is Latin for feral. The Florida Cracker Horse Association (FCHA) was formed in 1989 by cattlemen interested in protecting the breed from extinction. The FCHA Registry was created in 1991 and started with several “foundation horses” (horses of known ancestry from cracker lines of long standing). By the year 2000, the Registry included 130 foundation horses and 285 descendants. These horses are (Equus ferus caballus). It is the Mongolian horse (Equus ferus przewalskii,) that is critically endangered. This is really beautiful - thanks!